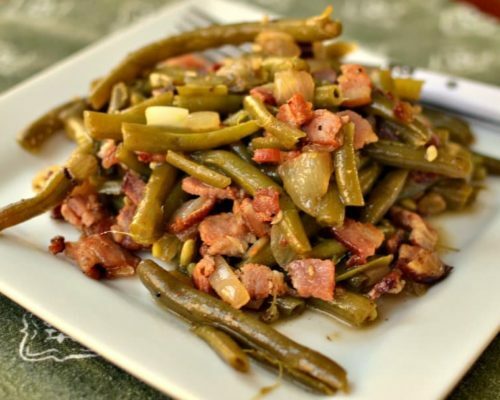 Southern Green Beans are slow cooked string beans combined with onion, garlic and crisp bacon. The end result is heavenly with scrumptious tender melt in your mouth green beans. These are not to be confused with northern style green beans which are cooked crisp tender, sometimes with crispy bacon or with just a little bit of butter, garlic, salt and pepper. My family adores these Southern Green Beans! Boy do I love some Southern cooking!! Southern cooking brings comfort like fluffy slippers to cold feet. Southern cooking is a cure all for whatever ails you and may be the best regional cooking ever!!! These Southern Green Beans are no exception to that rule. I could quite literally eat these with every meal perhaps even breakfast. If you have never tried these you MUST give them a whirl. As with most good southern comfort food all you really need is a little time as they simmer for a an hour or so. Now isn’t that how the south rolls like a fine oiled machine!! 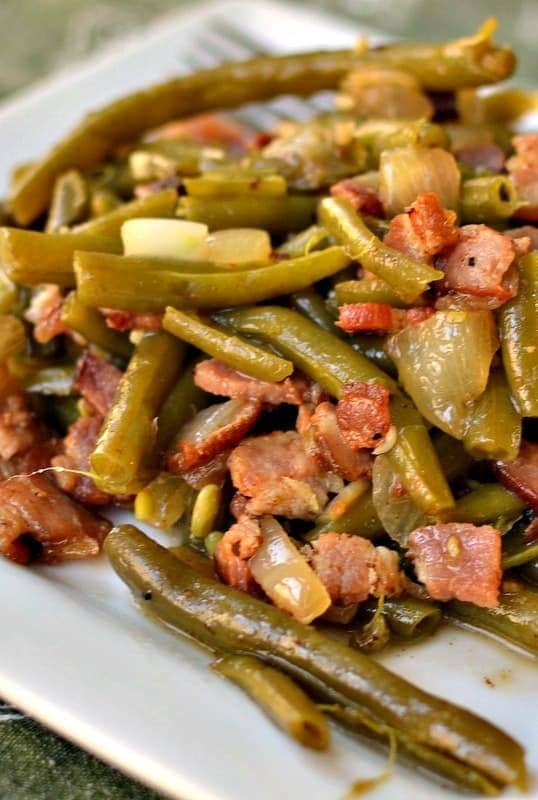 Now these Southern Green Beans combine fresh green beans, smoked bacon, and onion into the most mouth watering side imaginable. Prep is a breeze and your family will be singing your praises. How to cook fresh green beans southern style. Folks it really does not get much easier than this. First It takes a little patience while they cook but I am sure you have other chores to attend to. Then simply brown your bacon, then add your onions and garlic. Remove these and set aside. Using the same pan add your trimmed green beans, chicken broth and seasoning. Simmer for at least one hour and drain chicken broth. Add bacon, onion and garlic to the green beans and heat over low for a couple of minutes. How to season Southern Green Beans. Seasoning can be very personal with people so here are some options for my whole spectrum of readers. For those of you who like a lot of flavor (myself included) add some Cajun seasoning. You can include anything from one half teaspoon to a full teaspoon. Readers with a more sensitive palate that want to tone it down can add a couple of pinches of crushed red pepper and about a half teaspoon fresh cracked pepper and salt. For those of you who really like it toned way down just one half teaspoon each of fresh cracked pepper and salt should be enough seasoning. Any combination of the above is good as well as most people know their seasoning tolerance. Oh heavens. The possibilities are indeed endless. 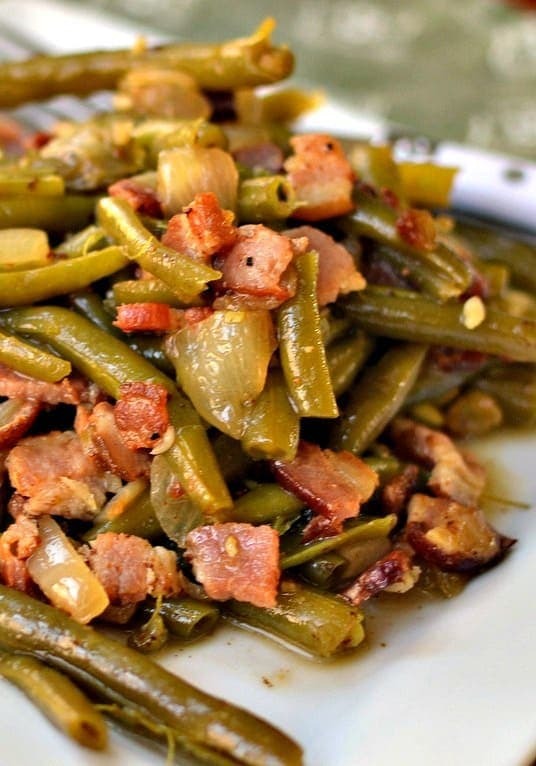 These amazing Southern Green Beans are easy, dependable and delicious. What are you waiting for? These are a must try. Put the ingredients on your shopping list today!! Other southern recipes you will love!! This post was originally published November 16, 2016 and was republished October 24, 2018 with new content. 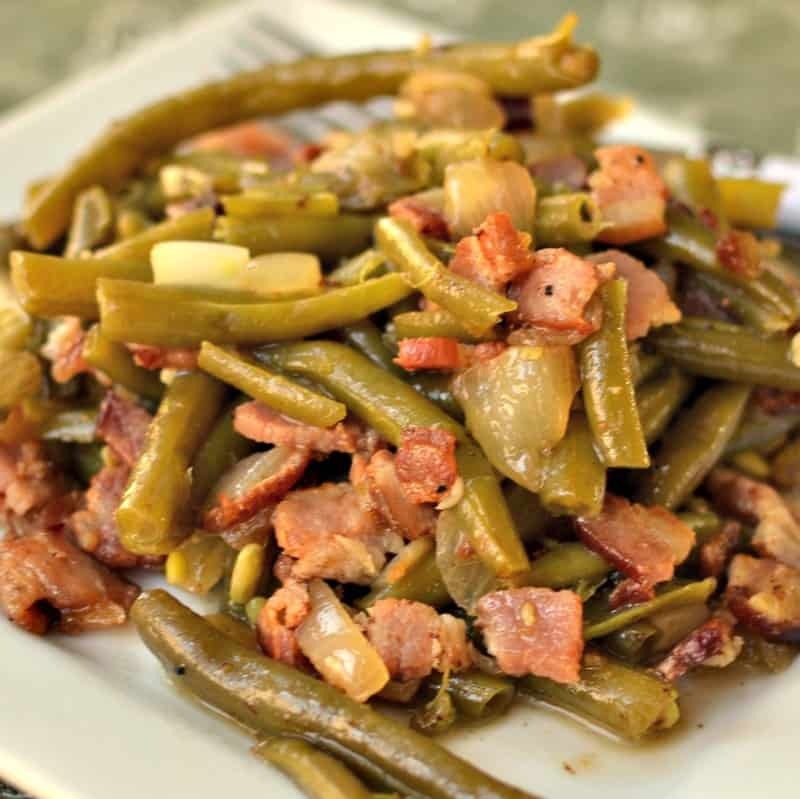 Now these easy Southern Green Beans combines fresh green beans, smoked bacon, and onion into the most mouth watering side imaginable. In large saucepan over medium heat cook bacon until almost completely brown. Add onion and cook for additional 5 minutes. Turn heat to low and add garlic; cook for 30 seconds. Remove bacon/onion mixture to a bowl. Do not wash saucepan. Add green beans and enough chicken broth to just cover the green beans. Add Cajun seasoning. Bring to a low boil. Cover and reduce to simmer. Simmer for 1 – 1 1/2 hours stirring occasionally. Drain chicken broth, return bacon/onion mixture and heat for 1-2 minutes. Add butter, stir and serve. Readers with a more sensitive palate that want to tone it down can add a couple of pinches of crushed red pepper and about a half teaspoon fresh cracked pepper and salt. For those of you who really like it toned way down just one half teaspoon each of fresh cracked pepper and salt should be enough seasoning. Any combination of the above is good as well as most people know their seasoning tolerance. IIs the nutritional information for this recipe available? No I am sorry. However there are places on the internet where you can plug in the ingredients and get the nutritional stats. This is the best recipe I’ve tried for true Southern Green Beans. Made exactly as instructed. I give it 5 star. Will definitely be in my rotation. Thank you. Thank you so much! So glad that you loved them! Makes my day! Do you cook every thing in the bacon grease then after drain it? No I do not drain it unless their is an excessive amount of grease. A little bacon grease in the chicken broth while they are simmering will help flavor them. Great stuff, been making this with the odd potato, carrot or corn on the cob mixed in for about a year now. Always a big hit. Thank you for posting it! Thanks so much! You are most welcome. My pleasure! Great ideas about your add ins! Can you tell me how many servings this is for? Seems like a long time to cook the beans?? Some people love them and some people don’t. Most northerners hate their beans this way and most southerners love them. We live in the Midwest and we love them. Can you do this in the crock pot ? Yes I am sure that you can if you brown your bacon separately in a skillet. I have to thank you for this recipe. I have to tell you, I was very concerned about the simmering time and I had to delete the onion. But this was the first time in 40 years that I was excited to put green beans on the table. Okay cool. If you are super concerned, than test them after a little while. This recipe is for super tender green beans. My husband adores them. I sure hope you love them as much as we do! I can’t wait to try this out for Thanksgiving!! Now I understand! I’m a Southern California native born to 2 Southern California natives. My mom always made green beans like this. As my sister and I got older we wondered why on earth mom always overcooked the green beans! My mother’s daddy was pure Texan, and he taught my grandmother to cook. Our beans weren’t overcooked, they were Southern Cooked! Thank you for solving our mystery!! Sure no problem. The nation is definitely divided on how to cook green beans! LOL! I love my beans like this!! These were fantastic, thank you! My pleasure Sarah! So glad that you liked them!! Do you dice the bacon before or after cooking? Excited to try this out! Before but you honestly could do it either way. I am making this tonight for my family! They love them so much! Thank you for a delicious way to cook green beans! I ate the leftover green beans for dinner the next night. That’s all, those green beans. They are so good I didn’t crave anything else. I’m going to have green beans a lot more often! Awesome! So glad that you liked them. We love them too! They are one of our favorites! You don’t have to have the liquid in there to reheat on a low temp. You can also throw in 1-2 tablespoons of butter.